I gave an hour-long presentation last Saturday for the Digital track of the FL SCBWI mid-year workshop and am happy to report it went very well. Emma Dryden of DrydenBooks gave an excellent overview of digital books and the changes in children’s publishing. Agent and consultant Rubin Pfeffer discussed the process of creating A Present for Milo and much more, while Curtis Sponsler kept our varying devices hooked up properly plus gave many great tips for authors about hardware, software, online resources, and other techie goodies. One cool idea he mentioned is that you can make a book trailer using Keynote... who knew? If you have a Mac, you can download the Keynote Mac app for $20, create a “presentation” (i.e. trailer) with moving images and text, add the audio in various ways (iMovie is one), then export it to QuickTime and load it on YouTube. The Keynote app gives options that iMovie doesn’t have, such as being able to float any font you like across an image. Anyway, for links to the speakers, the book apps I discussed, notes, plus links to DIY app-creation software, please check out this post on my books blog. Picture book (PB) apps are not the same as standard picture books in many respects. (These issues are top of mind at the moment because in addition to working on my current picture book app project, I’m giving a presentation in a couple of weeks for the FL SCBWI about how to go about creating them.) Page count is one way PB apps are very different. As any aspiring author/illustrator who has done a teensy amount of research knows, a standard print picture book has 32 pages. Historically, that number arose from the way books are printed plus market expectations. To see a layout template, check out this storyboard tutorial from the classic picture book how-to book Writing With Pictures, by Uri Shulevitz. For authors, this translates into 14 or 15 double-page spreads that will have text on them. 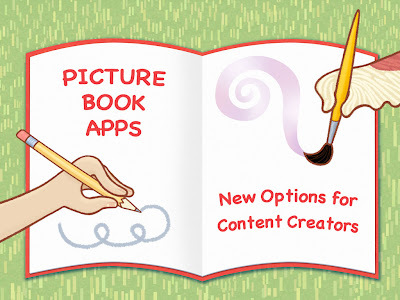 Picture book apps don’t have a standard number of pages, nor are there double page spreads. Hmmm! In looking at a few apps, the number of pages (screens?) ranges from less than 10 to 30 and up. Some nonfiction PB apps may have even more. It’s really up to the app creator(s) to decide AND for app buyers to vote with their $$$. From a storyline standpoint Milo has about 17–20 pages, depending on how you count them (one of those things you just have to see by exploring the app.) Milo is a good example of a PB app with charming artwork, a sophisticated design, and well implemented interactivity. It feels like a print picture book + More Fun Stuff. Note that it was conceived as a PB app and isn’t an adaptation. Reportedly there will soon be a print edition, which will make for an interesting comparison. Another wild card with any electronic book is that because revisions are so much easier, creators may decide to add more pages at any time. Say you’ve published a PB app that people seem to like (they’re buying it!) so why not change/add something to freshen it up? Perhaps some additional interactivity or a coloring page or two. That would reward previous buyers and hopefully inspire them to show your app to their friends. I love app updates that add something new, don't you? In short, the answer to the title question “how many pages should a PB app have?” is: it depends. Hopefully as you’re working on it, the PB app will tell you how many pages it needs. What do you think?